50% of females eventually develop osteoporosis 50% of males eventually develop a reduction in mineral density of femoral neck and lumbar vertebrae. Stress Trouble sleeping Headache Muscle ache Menstrual problems Weight gain:  Increased risk for Type 2 diabetes, high blood pressure, cholesterol, gallbladder disease, heart problems, etc. 9: To be successful, treatment of eating disorders must include a team approach among physicians, registered dietitians, and psychologists. Describe the role of each in treatment. (Nelms, 274).  Physicians: Assess medical status and provide medical treatments, medications, etc. to help patient with any medical problems they're dealing with as a result of eating disorder. This may be to restore electrolyte imbalances, take laboratory tests, vital signs, etc. Also specialized physicians may be involved if the problem is focused on a certain aspect, such as renal doctors during kidney failure.  Registered dietitian: Assess nutritional status of patient, address patient's food and nutrition issues/behaviors, and to monitor responses to treatment. Also to communicate findings with other members of the team when necessary. Develops a nutrition plan, continual support for patient to accomplish goals that were established. Psychologists: Psychologists are involved to help the patient realize their problems that caused them to develop an eating disorder, to discuss personal issues they are having and how they can overcome them, to establish better self-esteem and body image, and to be a support system. The psychologist engages in therapy to help the patient recover; there are many different approaches to treating ED's. Primary prevention: programs that are created to prevent eating disorders before they begin. o Student Bodies Prevention Program at Stanford and Washington University; gives tools about assessing self-esteem body image, etc. while also giving information about nutrition, exercise, etc. o Operation Beautiful: a series of books that started from a blog that enforces the beauty everyone has in each of us, promoting self-esteem and positive body image.  Secondary prevention (sometimes called “targeted prevention”) refers to programs or that encourage the early awareness of an eating disorder–to recognize and treat an eating disorder before it takes over someone's life. The sooner an ED is discovered and addressed, the better the chance for recovery.  Avoiding yo-yo dieting or crash-dieting; these usually cause people to restrict too much which leads to bingeing or unhealthy ideals like cutting entire food groups or eating excessively low calories which can lead to eating disorders.  Go to counseling: If someone is having psychological issues either intrapersonally or interpersonally, a psychologist or counselor can help them express their emotions and find a healthy outlet for their problems. Don't strive for perfection: Realizing there is no such thing as a perfect body or a perfect diet and that we are all different is key to not developing an eating disorder. 68 inches1.727 m 115 lbs52.27 kg 52.27 kg/(1.727 m)2= 17.5 kg/m2 This is considered underweight. The cutoff for diagnosing anorexia is not defined (Nelms, 271), but a BMI of 17.5 is low. Some sources believe that below 16 kg/m2 is considered anorexia, whereas other sources say that 17.5 kg/m2 is the cutoff point. 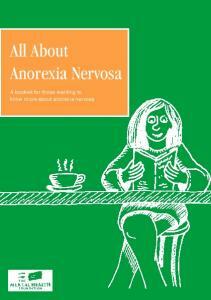 Report "Case Study: Anorexia Nervosa & Bulimia Nervosa"